Fairy tales are so embedded in our shared cultural knowledge that when someone uses them to make a joke, everyone gets it. This is part of what keeps them alive in our society. A good example of this is the hipster Little Mermaid, a web phenomenon which uses a photoshopped image of the character from the Disney film to make jokes about hipsters. 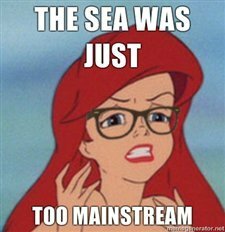 Although hipster Ariel makes reference to specifically the Disney versions of these well-known stories, it’s an interesting study of fairy tales as something to which everyone in our society can relate. Even though we cannot see her fins in this photo, we know that this is a picture of a mermaid. Likewise, the phrases make reference to lines from the movie that many are familiar with. Even though the Disney films do not depict the original versions of these tales, these movies have been an important part of their continued evolution. Our ability to reference them in jokes is proof of that.